Political parties use these news channels, along with entertainment channels, to promote themselves and their election agenda. 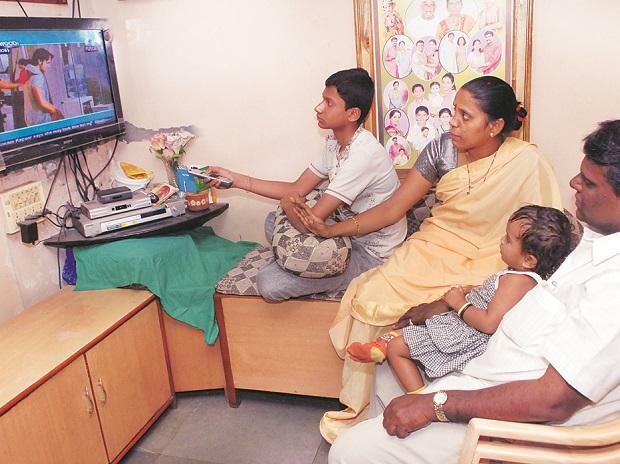 This year’s election campaign is expected to generate Rs 50 crore as ad revenue for the local cable industry. Local cable channels are operated by multi-system operators, and/or local cable operators, and usually cover a smaller geographical area, usually a district. In a non-election year, the ad spend on local cable channels is Rs 60-70 crore. In the recently concluded state elections alone, national parties — BJP and Congress — spent Rs 8-10 crore on advertising on local cable channels, say sources in media planning and buying. According to the advertising data recently released by Facebook, the BJP spent Rs 4 crore on social media platform ads in February alone. Given that political campaigning usually lasts four months, parties are expected to spend almost the same (which they are spending on Facebook) amount on local cable channels per month. Of the 2,000-odd cable channels, around 1,100 are movie channels in various languages. Of the remaining ones, there are around 220 news channels (in various languages) giving viewers news about developments in their locality, and the surrounding areas. "Cable channels, by definition, are localised and hyper-local. Therefore, they allow addressability at a constituency level. Therefore, think national and go local with specific issues of the national agenda, which is critical to that constituency. This can be addressed on the narrowcast channels through the cable network,” said Sharad Alwe, founder and managing director at Update Advertising, an agency that specialises in media planning and buying on cable channels. So, while national satellite channels can be used to prioritise national overarching agenda, local cable networks can be used to highlight local issues by the concerned contestant based on his/her strengths. Further, local cable channels can be used to demonstrate work by the candidate or the party in question for that particular constituency. Sometimes local cable channels replace the more traditional media platforms, which may not be available. For example, during last year's state elections in Chhattisgarh, parties used cable channels extensively to reach voters. It was helpful as the terrain in the region does not support outdoor advertising to a large extent. 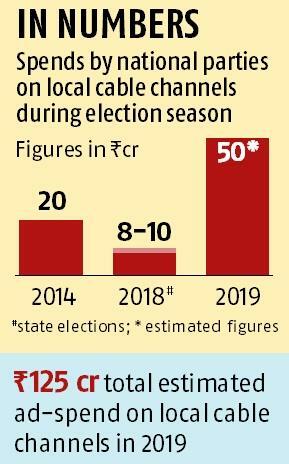 Given the proliferation of cable channels over the past decade, estimates show there are at least 20-25 local cable channels for every constituency in the country. This means that each constituency can be targeted in a localised way. “One of the biggest advantages these channels have is localised reach. Since cable channels are specific to the parent cable network, they are part of the distributor’s (cable operator) base pack, giving the channel reach. The consumption of cable channels increases as one moves away from the metros as people want to consume content that is relatable to them,” another planner said. While national news continues to have consumption beyond the metros, local news is also consumed voraciously. Over the years, these channels have introduced innovations in the way parties can advertise. These include banner ads, using the electronic programming guide space, apart from commercials and branded advertising. Additionally, political parties can have these channels cover events and debates that their candidates sponsor, or appear in. The campaigning done by Indian political parties today is similar to the UK and US elections. “If one were to look at elections in the US or the UK, the verdict has shown that winning candidates gave a distinct local twist to the national agenda and picked on the core concerns in each constituency and addressed them with winning arguments. This was done using local media like local cable networks, digital media, local radio stations, local newspapers, among others. We are seeing a similar approach by the key political parties in India this time," Alwe said.